The AZSecure Cyber Security Fellowship program is an integral part of the Management Information Systems program at the University of Arizona, which has been ranked as one of the top 5 Information Systems programs in the U.S. for the past 25 years, according to U.S. News and World Report (2018). Mejias said the these two outstanding CSU-Pueblo CIS students will join the top 1 to 5% of information technology graduates from outstanding U.S. universities in addition to the best I.T. students from Asia and India. 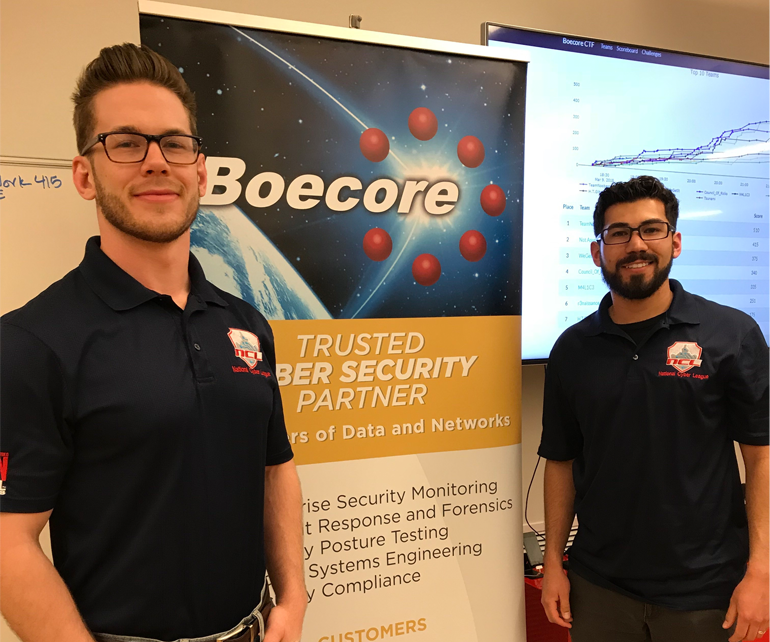 Greer received the AZSecure Cyber Security Fellowship for the Government Service track and Ullman was offered the AZSecure Cyber Security Fellowship into the Industry track. Both University of Arizona Cyber Security program tracks offer 100% out-of-state tuition (valued at approx. $35,000 per year) for the two-year graduate program, plus individual Student Health Insurance coverage in addition to numerous other educational benefits. Greer and Ullman will join fellow 2015 CSU-Pueblo CIS/Cyber Security graduate Johnny Voss at the University of Arizona’s Cyber Security Program. “These two new CSU-Pueblo additions to the University of Arizona’s top ranked MIS graduate program will certainly generate a pattern of hardworking, quality CIS/Cyber Security students that CSU-Pueblo is sending out to top Research Level-I Universities,” Mejias said. All three graduates will be under the expert mentorship of famed researcher and author Dr. Hsinchun Chen, University of Arizona Regents Professor, and founder and Director of the AZSecure Cyber Security SFS funded by the NSF. Mejias stated that a key part of the SFS program includes a obligatory summer Internship at one of several U.S. Intelligence Agencies or U.S government installation offering positions in Cyber Security. NSF-funded SFS graduates are then expected to secure full-time Cyber Security positions (fully-salaried) with any federal, state, local or tribal agency for two years following the completion of their Master’s degree. Employment placement for SFS program master’s degree graduates has been 100 percent.